The recent string of security breaches has allowed hackers to gain unprecedented access to your personal information, your healthcare records, and your credit card numbers. In the aftermath of each security breach it was determined the companies hacked were fully prepared and well protected when it comes to technology defenses. However, investing in only technology is no longer enough. 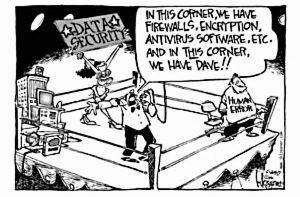 Often it is misperceived just using technology to protect your network is all that is required. Hackers have resorted to age-old techniques involving social engineering, employee exploitation, and physical penetration onto the premises. Protecting your organization is now a 3-pronged defense: Administrative, Physical, and Technology. Omitting any one of the 3 will circumvent any other security measures in place. Administrative actions are critical in protecting a company’s data assets through APT Total Security™. Organizations must create a Culture of Security transforming employees from security liabilities into security assets. A myriad of employee actions cause security breaches millions of times each day. Clicking malicious links, opening malware email attachments, and using simple passwords all can be controlled by Technology. However, providing passwords to other users or unknown IT staff, granting access to sensitive data for non-critical employee positions, and other human errors can only be solved by Administrative policies that include end-to-end Security Training and Privileged Access Control. Physical defense of APT Total Security™ involves physically securing access into an organization and rooms that contain or allow access to sensitive data. It also involves asset control and physically securing equipment such as USB drives, and other portable data storage devices. Technology is the final defense of APT Total Security™. At the center of the network security is the use of Firewalls. They can protect and organization’s IT infrastructure through Content Filtering, Intrusion Prevention, and Data Packet Inspection. Firewalls also monitor network traffic, mitigate employee actions, facilitate Mobile Device Management, and Remote Access Control. Combining Administrative, Physical, and Technology layers to your organization’s culture ensures your business will be protected from the threats of the 21st century. Choosing the right technology business partner to seamlessly integrate technology, processes, and people, to develop end-to-end IT security solutions is crucial. To assist your organization with developing a strong IT security solution contact Computer Business Consultants, or visit www.ComputerBusiness.com.